The 2018 Cheltenham Festival will leap into life on Tuesday 13th March and bet365, one of the biggest firms in the industry, have been launching sensational offers ahead of the ‘Greatest Show on Turf’! Take a look at the bet365 Cheltenham betting promotions ahead of the four-day extravaganza. The leading bookmaker are the first firm to go NRNB on every race at the Festival. If your horse in a non-runner, you will get your money back! bet365’s ITV Racing 4/1 Offer states that if you back any single winner at 4/1 or greater and the race is shown live on ITV then they’ll give you a free bet to the same stake as your first bet to use on the next race. This is a continuous offer meaning that if you back another winner you’ll get another free bet and so on and so on. Given that ITV will be showing all of the races from Cheltenham this offer is awesome. There’s plenty of opportunities to find winners priced 4/1 or higher at Cheltenham and if you can you’re getting a double whammy. If you back a 4/1 winner at £50 you’ll return £250 in total plus get a £50 free bet on the next race – you can’t get better value than that. bet365 also offer a price promise on all Cheltenham Festival races live on ITV so bet365 guarantee to be the top price of all major bookmakers on the live races across the Festival. Yet another bet365 promotion means they will guarantee to pay you at the best price, place your bet with bet365, take the price on your selection - and if the SP is bigger you will get paid out at the bigger odds! To ensure you get the best Each-Way value, bet365 will be paying 1/4 odds a place on ALL Cheltenham races and offering extra places on selected races during the four-day spectacle. Finally you can watch EVERY race of the 2018 Cheltenham Festival live on your laptop, mobile or tablet. The bet365 live streaming service is now even better than ever and with their new embedded player you can watch the action from inside the race card. To launch the player, simply place a qualifying bet, click on the WATCH icon located next to the At The Races or Racing UK logo at the top of the card and enjoy the action. 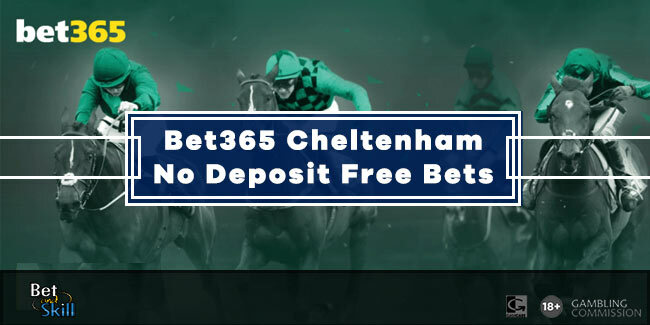 "Bet365 Cheltenham Festival free bets and betting promotions"